It is the objective of the government to help and uplift standards of sports ofthe rural talented youth to reach national and international arenas, as it is is assured in the Mahinda Chinthana Future Vision. This was stated by President Mahinda Rajapaksa upon declare opening the refurbished Jayathilake Sports Complex in Nawalapitiya. The Nawalapitiya Jayathilake Sports Complex, which was redeveloped at a cost of Rs 250 million, is the first of the nine well equipped and perfect provincial level sports complexes under the ‘Regional Sports Facilities and Complexes Development Program’ launched by the Sports Ministry. It includes a main sporting stadium with 400 m track consisting of 8 lanes, with an additional 200 m warm-up track, a well equipped gymnasium and a football/rugby ground, a swimming pool with 8 lanes and an indoor stadium which will facilitate 25 sporting events. A hostel, restaurant, medical centre, VVIP pavilion with 300 seats, VIP pavilion with 500 seats and a pavilion with 20,000 seating capacity are among the other facilities available in this complex. 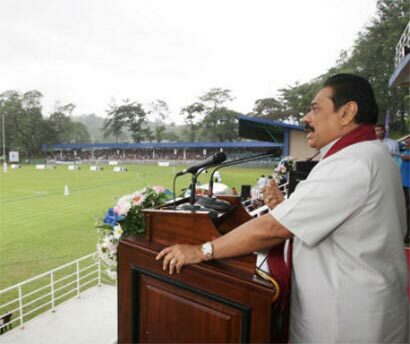 Speaking further, the President said that Nawalapitiya has become a beautiful and active city and the quality is further enhanced by the beautiful and scenic Jayathilake Sports Complex, and the challenge is to make maximum use and to preserve this property well and it is the responsibility of sports personnel and relevant administrators. The president also commended Sports Minister Mahindananda Aluthgamage for the efforts being taken by him to give the rural sports personnel the facilities they need. He said that it is the expectation of this government to identify the hidden talents of the sports personalities and the youth in the rural areas and induce them to rise up to international levels. The President said that most of the sports personalities who made records recently were hailing from village areas. Due to this it has been proved that we have talented sports personalities in the village areas and their talents remain hidden. The President further said that it is the objective of the government to build a healthy youth generation in the country. Minister Mahindananda Aluthgamage speaking at the function said that it is the expectation of the Ministry of Sports’ to improve sports in Sri Lanka to international standards through the seven year National Sports Policy. He said that the National Sports Policy will help to overcome the setback that Sri Lanka faced during the last few years. Through this, it is expected to produce a national sports culture and to assist in the development of the national economy. The Minister also thanked the President for the enormous assistance being provided for uplifting the Nawalapitiya Town. He said that Nawalapitiya has been built on Mahinda Chinthana and it is a town that has been built with all facilities in a very short period of time. The President also declared open the new building of the Nawalapitiya Urban Council. The Chief Minister of the Central Province . Sarath Ekanayake, and several peoples representatives attended the function.